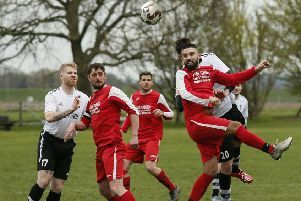 Ampthill Town tuned up for their Beds Senior Trophy semi-final by putting in another polished home display to beat Arlesey Reserves 6-1 on Saturday. Following a 4-1 victory over Winslow a week earlier, they sealed a conclusive win over the basement side before their clash with Kent Athletic this weekend. A superb first half display put them well on the way with five goals before the break, and the side have found form and goals before their meeting with the unbeaten Luton club. Ampthill could have gone ahead in the first five minutes when Danny Butler hit the post from close range. But Town did not have to wait too long for the goals to come, and Brad Clarke produced two clinical pieces of finishing in a five-minute spell midway through the half, with the midfield providing his chances by slicing open the away defence. Danny Butler drilled home the third from a sharp angle, and Dean Dummett struck for the fourth before Clarke completed his first half hat-trick from good work by Butler. Ampthill created more openings in the second period but had to be content with Mike Draycott’s 65th minute effort. Arlesey showed more effort in the later stages and scored a consolation goal, while Jack Ambler made some good stops. It was another superb showing from Town who have recovered from a four-game losing run to chalk up two comprehensive wins. They will need to maintain that level against Kent Athletic to gain a place in the Senior Trophy final. They have beaten Pavenham and Flitwick in previous rounds and Kent will field an experienced side. The tie kicks off at 3pm at Ampthill Park. On Tuesday Town visit Harpenden in a league clash before receiving Crawley Green at the start of a busy spell for the team.